The black stork is exhausted. The long journey to his non-breeding grounds south of the Sahara desert was arduous. The majestic bird is desperately looking for a place to rest, where he can recover and refuel until taking up his journey to return to his breeding grounds in a few months time. But instead of water and wetlands, which were once common across the region, all he sees is sand and dust. Gradually his black wings flap more slowly and his tired eyes continue looking for a place to rest - in vain. In a few decades, this scenario might become reality. We are on the best way towards it. Human-induced climate change has begun to affect our planet and the organisms that live on it. Many migrating birds are very sensitive to environmental changes and are already being affected by climate change. Increasing temperatures, changing vegetations and extreme weather conditions lead to significant changes of the birds’ essential habitats. In many cases these are likely reasons for the decline of bird populations and changes in migration patterns. The ways in which migratory birds respond to these environmental changes differ across species: Generally speaking, short and middle distance migrating birds can adapt to climate changes more easily, whereas long distance migrants are at a disadvantage. Their migration rhythm is usually more fixed and they struggle with readjustment to changing temperatures. Because of this rigidness they suffer more from the impacts of climate change than other birds. One of the major effects of climate change is the loss of habitats. The habitats migratory birds depend on are in danger to change and to disappear due to increasing temperatures, flooding or desertification. Coastal wetland areas that migrating birds use for nesting and foraging are an example. During their migration, birds rely on these areas to provide food and resting places. There they can refuel and repose before continuing their long journeys. Rising sea levels due to climate change cause the flooding of these habitats and they are lost for birds and other animals. Without these stop-over places, the birds have insufficient reserves to continue and have difficulties completing their journeys. The loss of habitats continues through increasing desertification for example of the Sahel region. Increasing populations lead to a demand for more land to grow crops and graze animals and to the intensified use of land. This contributes to further land degradation and leads to expansion of desert areas. Climate change worsens the effect by a decrease in rainfall in the Sahel region. As a consequence of the dryness, the desert expands further. The crossing of the Sahara is one of the most challenging parts of the birds’ journey because they have no possibility of resting. The Sahara expansion, combined with destruction of the habitats, gradually makes it nearly impossible for African-Eurasian migrants to cross this ecological barrier successfully. A lot of them will fail and perish. Other habitats, among them many breeding habitats, are also strongly affected, for example the Siberian tundra where many goose species breed. They use the tundra’s rocky bedrock for breeding and raising their offspring. However, climate change is rapidly changing its vegetation structure: The increasing temperatures make the permafrost soil thaw, enabling forest to expand into the tundra. This new green carpet changes the habitat completely and makes it impossible for the geese to breed. Experts predict a loss of 10 to 93 % of the breeding habitat area of different arctic goose species as a result of this forest expansion. 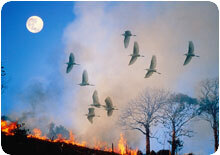 Global warming also influences the routes of many migratory birds and their annual migration rhythm. A lot of migratory birds change their routes, shorten or completely cancel their journey as a result of changing temperatures. For example, some small bird species do not winter in Spain, France or in the north of Africa anymore. Instead, they prefer to stay in England, where they breed. Cranes, which normally migrate to Spain and Portugal, stay in Germany, accompanied by Starlings. Unfortunately their inactivity has severe consequences. They are not used to low temperatures and in case of a hard onset of winter, most of them won’t survive. Mild winters help resident birds to survive. They start to use food resources and breeding places of long distance migrants. As a consequence, long distance migrants might find their breeding grounds occupied by a large number of resident birds. This increases the competition between the species for food and breeding grounds. The warm spring temperatures in some regions have led to an earlier arrival of many birds. For example, British birds arrive at their breeding areas two or three weeks earlier than they did thirty years ago. Thus, they start to breed earlier. At the same time, increasing temperatures also make the vegetation bloom and insects hatch earlier. Unfortunately, these shifts are not in line with each other. The vegetation bloom and insect peak occurs even before the young birds hatch. As a result of this mismatch, the birds cannot provide enough food for their offspring. The earth’s climate has been changing throughout time. Some of the earth’s bird species were able to adapt to these changes, while others could not and have become extinct as a result. This is a natural process. However, the climate change we are experiencing today is different: human-induced global warming is happening at an accelerated speed and it is becoming increasingly difficult for many bird species to keep up with the resulting shifts. In addition, adapting to climate change becomes even more difficult for some species, because other man-induced threats add to the challenge. The world’s remaining habitats are also lost or degraded for many other reasons, such as pollution, fragmentation, or conversion and overbuilding. Furthermore, migratory bird species also suffer from barriers like wind farms or competition from newly introduced alien species. Species that are already on the decline due to these factors are especially vulnerable to climate change. In other words, for some species, climate change may give these already very vulnerable species the final push towards extinction. Regarding the different threats migratory birds have to face, one thing becomes apparent: climate change is already happening and it endangers migratory birds. Especially long distance migrating birds feel the effect; as they are less flexible than other birds, they suffer most. Climate change is in progress, and it is clear that it is affecting our environment, by adding to the disarrangement of ecological balances. It is not only in the interest of migratory birds, but also in our own interest to protect all species on the planet earth against the impact of climate change. Although the process cannot be stopped completely, we have the possibility to interfere. Everyone can join the fight against climate change every day: reduce the energy you use, turn off the lights, reduce heating and take up cycling. Check if the ministry in your country provides information on climate change – there are many have useful tips about what you can do! Start the energy-saving habit today! Another way to help is to inform others about these predicted impacts on migratory birds , by joining the World Migratory Bird Day 2007 campaign! This year’s theme ‘Migratory birds in a changing climate’ highlights the impact and extent of climate change on migratory birds and also accentuates the need for more conservation. Join in, take action and raise awareness for the needs of migratory birds! Help protect one of nature’s magnificent resources and let the Black Stork’s journey succeed. For more information on the topic of climate change and migratory birds please look at the links we provided for you in the links section.